Review: 1954 Alcatraz – Can You Escape the Island? 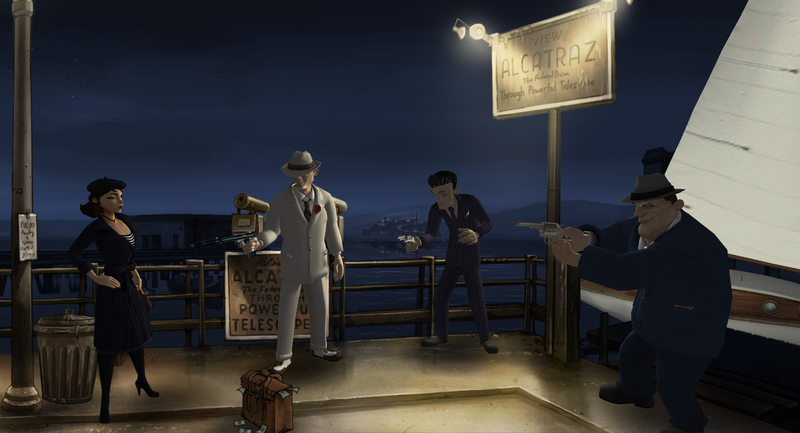 1954 Alcatraz is the latest game to be published by Daedalic Entertainment (Memoria, The Night of the Rabbit, Gomo, Journey of a Roach, the Deponia series, etc.) So far, I’ve enjoyed their original games much more than the ones they’ve only published, but their reputation is such that I’m willing to keep giving the published ones a try. 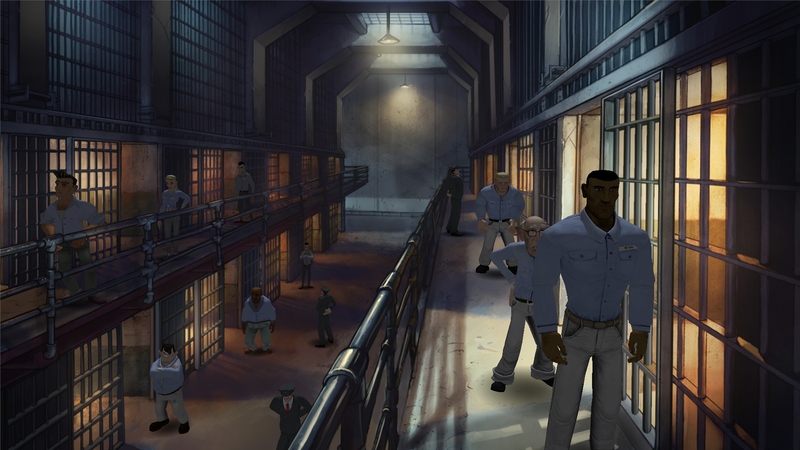 1954 Alcatraz has been in development since August 2009 and is the first game from Irresponsible Games. 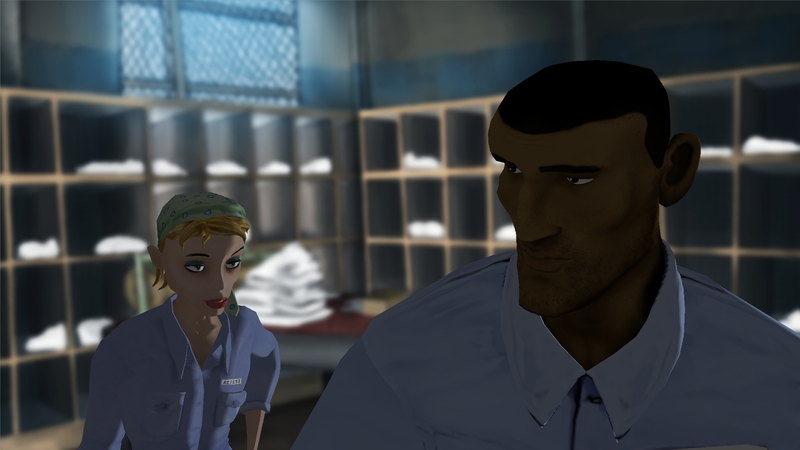 Joe’s goal is to get out of Alcatraz, and Christine is trying to find the hidden money before the end of the month so she and Joe don’t get killed by the obligatory sketchy mafia guy. Ultimately, they want to be able to run away to Mexico and/or Hawaii so they can be free and happy together. You get to play as both Joe and his wife, Christine. They’re a mixed-race couple in 1954 San Francisco, which is pretty awesome. How often do you see a mixed-race couple in a game, let alone play as them? This is also the time of beat poets and musicians, and the overall atmosphere feels authentic. Joe and Christine do not get a lot of prejudice thrown their way (besides from the villains), which I ascribed to the progressive people they hang out with. It took me 4.4 hours to complete the game. The graphical style is colorful and comic book-esque. Backgrounds are 2D and characters are 3D, and the game tends toward the realistic side. My favorite part was seeing the sunset after Christine leaves Alcatraz; the sky is gorgeous, and I was able to compose a nice scene with Christine in silhouette. The only thing that brought me out of the realistic feel was the goofy walks some of the characters had; it was like their legs were controlled by improperly-tied puppet strings. There were also a few clipping issues at times. You can activate 1954 mode in the options, which gives everything a sepia overtone with film lines, but the game was too colorful for me to want to play like that. 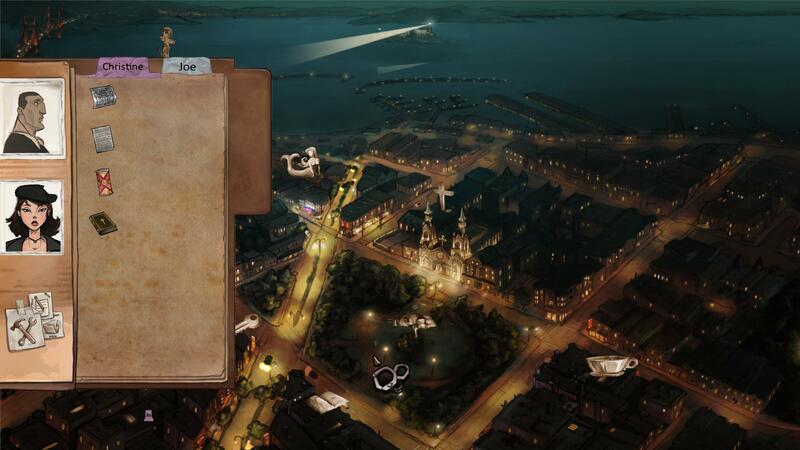 The map that Christine uses to travel between areas in San Francisco’s North Beach is beautiful as well, with animations like the Alcatraz lighthouse doing a sweep. The excellent soundtrack was composed by Pedro Macedo Camacho, known for Fairytale Fights, Ghost Pirates of Vooju Island, A Vampyre Story, and Audiosurf. There’s different music for everywhere you go, and there’s even some sultry noir singing at the beginning of the game and in the nightclub. The voice acting is of great quality, with no one sounding bored or not acting well. You begin the game as Joe, and will soon be able to switch between Joe at Alcatraz and Christine in San Francisco’s North Beach. Controls are typical for a point-and-click: left click interacts, right click examines, spacebar highlights the hotspots (which comes in handy in busy scenes). You can access the inventory by clicking on it, pressing the “I” key, or scrolling the mouse wheel. It’s possible to play the game using only the mouse if you don’t want to use the hotspot finder; this would add an extra challenge. Puzzles are very logical, generally speaking; there’s one that I don’t think I would have ever figured out without a walkthrough, but there always seems to be one of those in every adventure game. There’s also some aspects of non-linearity which will affect how the game turns out, which surprised me – you don’t often see that in adventure games. I can see some people calling this game too easy, but for me it hit exactly the right level of challenge where I wasn’t just moving through the story, but I also wasn’t looking at a walkthrough for every puzzle. The game offers twenty-five Steam Achievements (nineteen of which I had after my first playthrough; some of the conditions for the others are currently obscure) and eight Steam Trading Cards. This is easily one of my favorite adventure games of the year, with branching paths, well-rounded minority protagonists, excellent writing, and puzzles that make sense. Get this game if you’re a fan of point-and-clicks, and if you’re a gamer who plays for story, you’ll probably like this as well. 1954 Alcatraz has its own website here. You can follow Daedalic Entertainment on their official site, Facebook, Twitter, and YouTube. Check out what Irresponsible Games are doing on their official site. Buy the game on Steam, GOG, or the Mac Game Store for $19.99.